Soprano Lise Lindstrom is Turandot in San Diego Opera’s TURANDOT, Feb./March, 2018. Photo by J. Katarzyna Woronowicz Johnson. Puccini’s music lifts this bloody Orientalist fairy tale whose ancient origins are traced in a fascinating San Diego Opera program essay by Joseph Thomas, a San Diego State professor of English and Comparative Literature. The more immediate source is a play by Carlo Gozzi, a now obscure Venetian playwright who championed the Italian Commedia dell’Arte. In the telling of Puccini and his librettists, Giuseppe Adami and Renato Simoni, the icy Princess Turandot beheads her suitors one by one if they fail to answer three riddles. Her purpose is to wreak revenge on all men because her ancestor, the Princess Lo-u-Ling, was raped and murdered by a foreigner of royal blood. Turandot is #metoo with exotic symbolic castration. As the opera opens, the Prince Calaf, is visiting Peking in disguise with his blind father, the deposed Tartar king, Timur. Calaf arrives just in time to see the execution of the handsome Prince of Persia, but once he gets a brief glimpse of Turandot, he is smitten and immediately takes up the challenge of the three riddles. His ringing of a J. Arthur Rank-sized gong closes Act One with Puccini’s usual flair for the theatrical. Tenor Carl Tanner is Calaf in San Diego Opera’s TURANDOT, Feb./March, 2018. Photo by J. Katarzyna Woronowicz Johnson. When Act Two rolls around, Calaf passes the test easily, but the Princess, now considerably abashed and a very sore loser, tries to wrangle out of her arrangement. So, in a ludicrous display of fair play, Calaf sets up his very own quiz game: Guess my name and you can decapitate me as you wish. This turns out to be a terrible decision as far as the fate of Calaf’s dedicated slave girl, Liù, is concerned. She adores him and stabs herself with a knife before anyone can torture Calaf’s secret out of her. 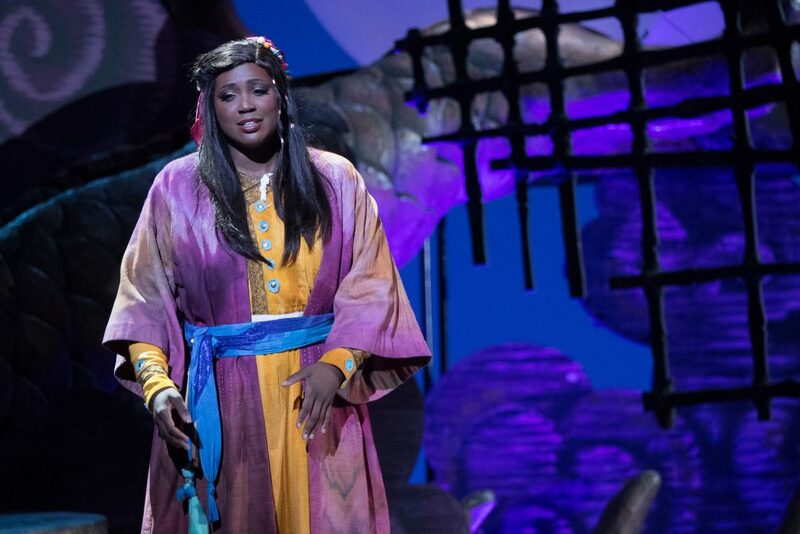 Soprano Angel Joy Blue is Liu in San Diego Opera’s TURANDOT, Feb./March, 2018. Photo by J. Katarzyna Woronowicz Johnson. At this point in the story and the score, Puccini died, leaving the opera unfinished. Unfortunately, Puccini’s colleague, Franco Alfano, completed the opera somewhat ineptly. The ice Princess melts at Calaf’s kiss (which got a laugh Saturday night here in San Diego) and she declares that she now knows his name — Love! The love duet is pathetic by Puccini standards. The transfigured night of Madama Butterfly, it assuredly is not! Undeniably, the existing ending of the opera is lame and fails to resolve any of the moral issues raised by the fairy tale. Several composers have contrived endings for Turandot — but the perfect finale would be the conductor turning around, putting down his baton, facing the audience and saying, “Here the composer died.” Or “Here the master laid down his pen.” Toscanini did this (in Italian, of course) when conducting the opera’s premiere in 1926. I’d like to see this done again. I wonder if anyone has tried it? Here in San Diego, the title heroine is sung by soprano Lisa Lindstrom, no stranger to the role. Her voice effortlessly pierces the ether in a tremulous beam. Although her sound has little warmth, Lindstrom possesses all the the big high notes, the stamina, and she looks quite credibly like a woman a prince might fall for. As in so many other operas, Puccini’s libretto places much emphasis on physical beauty, often requiring an enormous suspension of disbelief on the part of the audience. 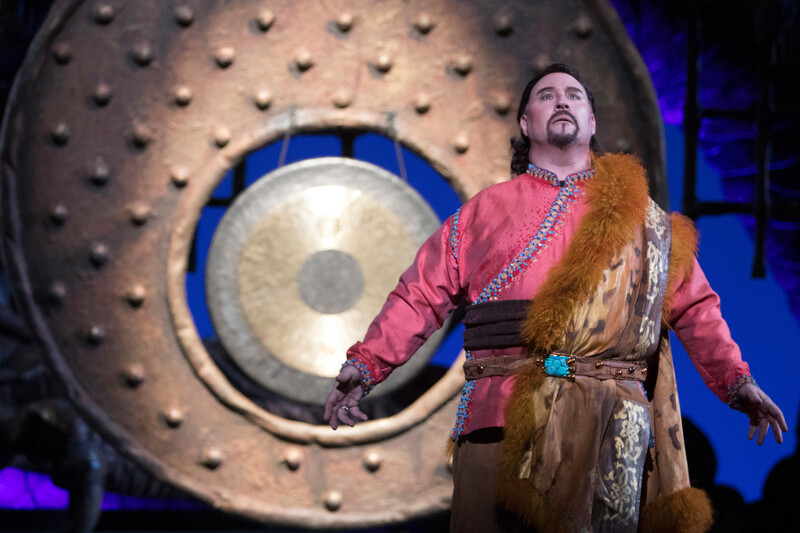 SDO’s Calaf is beefy-voiced tenor, Carl Tanner, a solid choice for a heroic Radames or Samson. He commanded a masculine presence throughout the entire opera and delivered a quite credible “Nessun dorma!”, the big third-act aria most opera lovers know by heart. Tanner is a fine artist, but I missed that squillo that characterizes tenors such as Corelli or Bjoerling. The new “world-class” (I hate that term!) voice of the evening was that of soprano Angel Joy Blue as the ever-loving, ever-suffering slave girl, Liù. She excelled in her famous arias (“Signora ascolta” and “Tu che di gel”), and her tone was plush velvet at all times, but she displayed a certain lack of spontaneity, a sense of physical restriction which, by the way, also affected some of her colleagues on this opening night. An exception to this was the young American bass Brian Kontes as Timur, who impressed as an old pro despite his youth. Here’s a wonderful singer who’s comfortable in his skin and on stage. We need to hear much more from this guy. For many opera-goers, the characters of the ministers Ping, Pang and Pong comprise a most frustrating trio. They hold back the entrance of Princess Turandot in what is perhaps the most delayed entrance in all of opera (except for a flash visual cameo in Act One). Saturday’s performance started at 7:09 pm, and the Princess did not make her full appearance until 8:30 pm. The three P’s take up the first half of Act Two complaining and reminiscing quite marvelously. The music is jaunty here, sentimental there, and is all wonderful if you are not feeling too impatient. 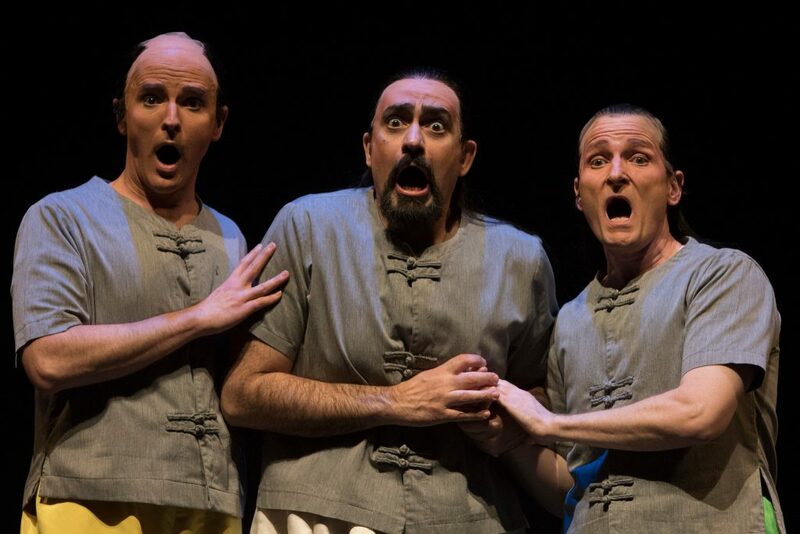 (L-R) Tenor Joseph Gaines is Pang, baritone Marco Nistico is Ping and tenor Joel Sorensen is Pong in San Diego Opera’s TURANDOT, Feb./March, 2018. Photo by J. Katarzyna Woronowicz Johnson. Ping is the Grand Chancellor, Pang the General Purveyor, and Pong the Chief Cook. It’s tougher to remember those professions than the answers to Turandot’s three riddles. (Spoiler alert: That’s Hope, Blood and Turandot.) But the three men are also hard to distinguish on stage. Tenor Joseph Gaines was Pang, baritone Marco Nistico was Ping, and tenor Joel Sorenson was Pong. Their long second act ensemble was beautifully accomplished — although they competed with Fern Street Circus acrobats and ghostly appearances behind a scrim. Somehow the familiar David Hockney scenery that I had expected got discarded on the way to Peking, so SDO got a jumble of visuals. Costumes appeared to be assembled from here and there, including some Emerald City frocks that had little wings suggesting the flying monkeys in Oz. 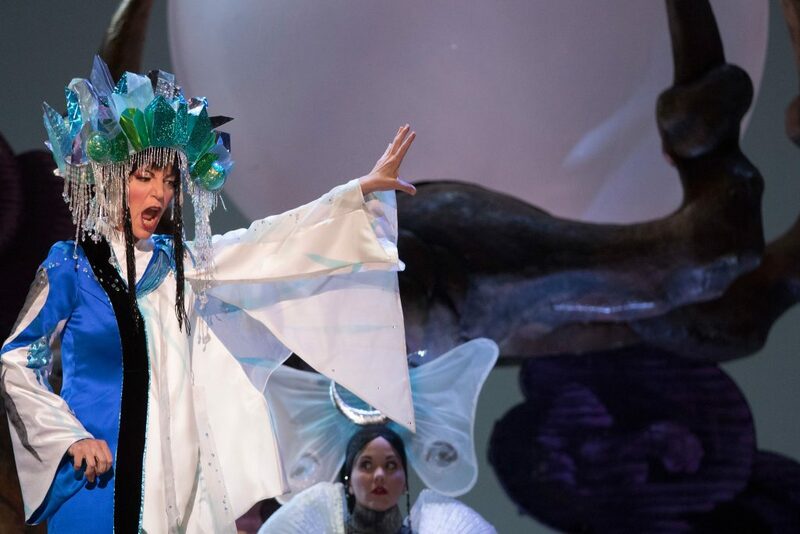 The production is credited to Bliss Hebert and Alan Charles Klein for Florida Grand Opera, the Dallas Opera, Houston Grand Opera and San Francisco Opera. Appropriate but kitschy Chinoisorie, all of it it — although some will find it “sumptuous”. De gustibus non est disputandum. Lucas Krech’s lighting was expressionistic — from the Mood Ring School of stage illumination. Things were dark or bright or red or whatever according to the emotional climate of the moment. This meant the opening scene, which should be dazzling, was all gloomy and drear. The set designs also relegated the Emperor (tenor Chad Frisque) from a central position to the left of the stage. The sprawling steps, also to the left, did not provide the Princess with much of a grand entrance. I’ll never forget Birgit Nilsson (San Francisco Opera, 1964) arriving with the 30-foot long train of her gown carried by her slaves. This train ultimately draped the tall central steps as she turned to the audience and extended scary, long red fingernails and sang “In questa reggia.” How can costume designers and stage directors resist doing something like this? Lindstrom’s entrance was vastly understated in comparison. 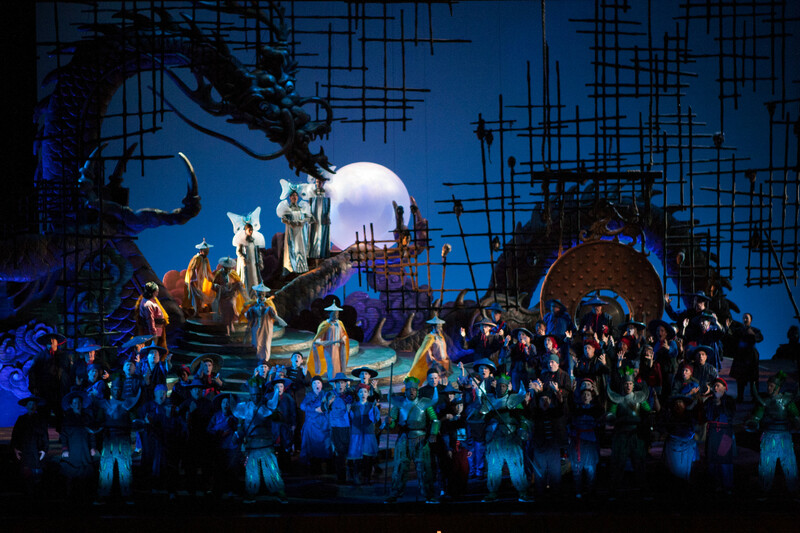 Director Keturah Stickhann did, however, provide many striking touches: Liu rising up after her death and walking off to a presumptive heaven; Turandot and Calaf all alone on an empty stage before the finale; Calaf kneeling solo at curtain rise. Her management of the often crowded stage was astonishingly skillful. To direct Turandot one must invoke Cecil B. Demille as one’s muse. I’d say Stickhann made her mark. I felt Valerio Galli’s mostly fine conducting of the San Diego Symphony orchestra lacked a consistently incisive and propulsive drive. Many passages dragged, including the “In questa reggia” — and there were several moments when the orchestra and performers fell out of sync. Bruce Stasyna’s chorus, a major character in this opera, was excellent. A scene from San Diego Opera’s TURANDOT, Feb./March, 2018. Photo by J. Katarzyna Woronowicz Johnson. Really? What about San Francisco Opera in 1977 with Montserrat Caballé (Turandot), Luciano Pavarotti (Calaf), Leona Mitchell (Liu), and Giorgio Tozzi (Timur), in a production designed by Jean-Pierre Ponnelle and conducted by Riccardo Chailly? Or the one I recall most vividly: San Francisco Opera in 1964 with Birgit Nilsson (Turandot), Franco Tagliavini (Calif), Pilar Lorengar (Liu) and Giorgio Tozzi again, stage directed by Lotfi Mansouri and conducted by Francesco Molinari-Pradelli? 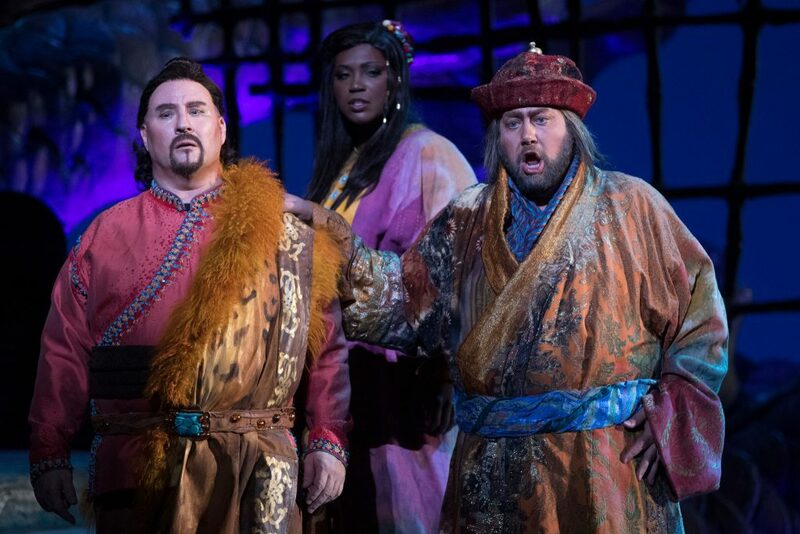 (L-R) Tenor Carl Tanner is Calaf, soprano Angel Joy Blue is Liu, and bass Brian Kontes is Timur in San Diego Opera’s TURANDOT, Feb./March, 2018. Photo by J. Katarzyna Woronowicz Johnson. Maestro Muller invoked Toscanini after Liu’s death during the sitz last time SDO put on Turandot; just before taking an orchestra break. Looking back, its one of the more profound moments I’ve experienced in a production.